For all those who have read my previous post, Dilip Bhujel needs no introduction. By profession, Mr. Bhujel is a cook and knows to dish out many a dishes and he decided to share with me one of his signature items – thukpa. Thukpa needs no introduction. 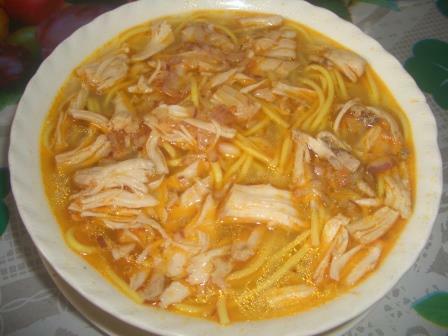 A hearty noodle soup and one of my favourite mid-week dinner item in winters and monsoon. If you are a fan of one pot meals, I recommend you to try this dish, in Dilip Bhujel’s style. 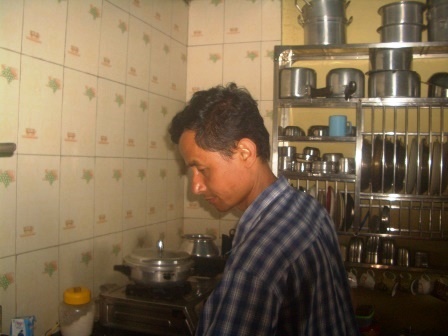 Dilip Bhujel while sharing with me the basic ingredients adds, “The trick is to use mustard oil”. So, for food lovers, this is a Nepali style thupka. As I scribble that in my diary, he unpacks three pieces of chicken legs (with skin), gives it a wash and adds it to a pressure cooker. After that he adds a handful of salt, a dash of coriander powder and a lovely helping of pepper and rubs it gently over the chicken pieces and pricks the chicken with his knife. As he washes his hands to chop vegetables, he tells that its best to pressure cook the chicken pieces with bones and skin. He takes out his chopping board, slices two medium sized onions, dices up half a tomato and finely chops five to six tiny pods of garlic to the chicken. After a spoonful drizzle of mustard oil and two cherry tomatoes he pours boiling water and pressure cooks it for a good twenty minutes. 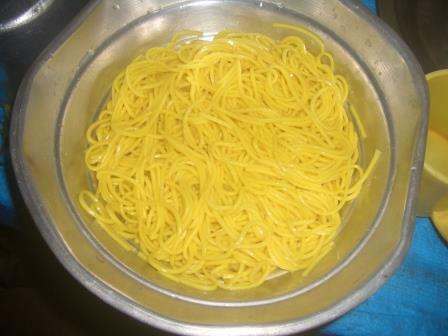 Now the next stage is to dress up the egg noodles. He adds egg noodles to a pot of boiling water and let it bubble way as the lovely pieces of chicken get its due resting time in the pressure cooker. He takes off the lid of the pressure cooker and strains the beautiful glossy soup to a pot. 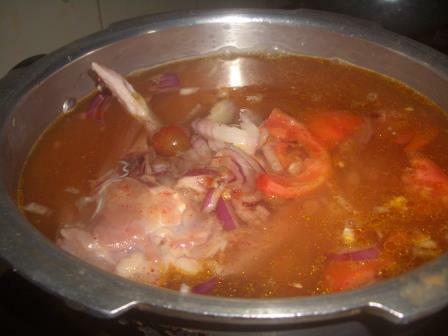 He scoops out the shreds of boiled chicken and the shredded chicken looks juicy and tender, and smells of the goodness of tomatoes, onions and garlic. He settles to prepare the sauce. First he boils three tomatoes, and peels them. He takes a handful of mint leaves, two pods of garlic, green chillies. Manju Bhujel joins in and takes out the grinding stone to make a nice paste of mint leaves, mashed tomatoes, garlic chillies and salt. Dilip layers the noodles, adds the soup and tops it with lovely shredded chicken, with his special sauce on the side and finishes off with freshly chopped lemon grass. This was one of the perfect one pot meal to celebrate a rainy day, end of a short trip and beginning of new friendships. If you are planning to stay indoors to enjoy the rains, I am sure you will enjoy cooking and eating this comfort food in Dilip Bhujel’s style sitting by your window. Enjoy the showers and keep cooking!